Rip Blu-ray Discs/folder to video formats, rip DVD and convert vide/audio files. It is outstanding FLV Video Converter for Mac software. Create DVD discs with personalized chapters, menus, titles, music and effects. Transfer all the files between iPod and Mac local disk without losing anything. Excellent software system gainings from the most asked for in download libraries! Investigate the featured software package lists, watch the hottest releases of the perfect tools, and test immediately! Do not lose an opportunity to setup the best tools: apply SoftEmpire directory to acquire solutions for free. Meet the directory of shareware and software package demo versions. Choose among operating system programs, download managers, games, and all other sorts of utilities for your notebook or cell accessory! 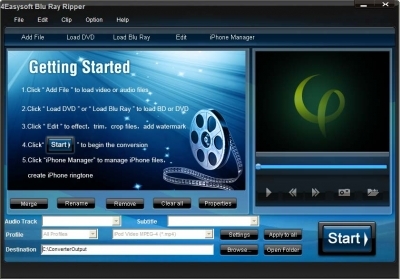 4Easysoft Blu-ray Ripper is the best choice to rip Blu-ray to video, it can not only rip Blu-ray to any popular video like MP4, MKV, AVI, WMV, etc. for iPad/iPhone/iPod, but also can rip DVD and convert video files.